It’s the day after the 2015 All-Star Game and MLB has released the Franchise Four for each of the teams. Depending on your personal feelings you may agree or disagree with the results, but honestly how do you even measure such things? Anytime one compiles a list of the Greatest of anything, how much of it is really objective and how much of it is emotionally based. I know my Franchise Four votes all had some sort of emotional tie to them. So where does this fit in with Baseball books? There are hundreds of books out there that compile some sort of all-time greatest list. So how do you know when you are getting an objective view, instead of what that particular author thinks? I think I have found two that are good sources for the fans. Both of the above books were written by Lew Freedman and released in 2015. If that name sounds familiar to veteran baseball readers, it is because Freeman has penned dozens of books about baseball in the past and these are two of his latest. Freedman is a veteran sportswriter that likes to delve into the obscure and often forgotten names of the game. Here he has compiled lists of the 50 greatest players to wear the respective team uniforms. I have read a few of Freedman’s works in the past and always found the books to be educational and historically honest. I expected no different from these titles. 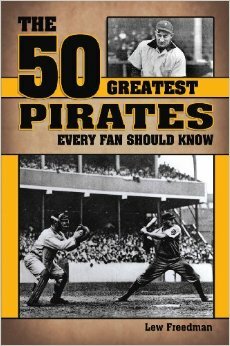 I will start with the Pirates book. They have been in Pittsburgh for a very long time and had some very big names call the steel city home. So I thought it was going to be hard to limit the pick to just the 50 greatest. Some of the names were easy picks such as, Clemente, Stargell, Kiner, Wagner and Traynor. But then there were a few others that at first glance made me ask why, names such as Hebner, Giles, Kendall, Bonilla and Thomas. Each chapter in the book ranging from 3-8 pages is dedicated to each player. You get a career bio, personal bio and why that player was special to his team. Even though the chapters are brief it does give you just enough information to see why that player was a vital cog in the machine. It gives a nice quick, detailed and informative overview of some of the greatest names to ever wear the uniform. 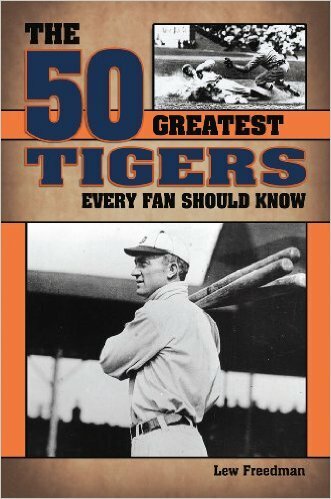 The Tigers book follows the exact same format and allows the reader to see who has stopped in the Motor City throughout their storied history. Cobb, Kaline, Gehringer, Greenberg and Kell were all easy picks for this list for me. But names like Steve Kemp and Pat Mullin made me scratch my head and ask why. The value in these books is that the name might surprise you, but the facts help back up the pick. So there is knowledge to be gained for the reader if you are not very familiar with each specific team history. These type of books also have another feature, beyond just being able to read them. If you ask 100 people to compile this list, you will get 100 different replies. If you and your friends enjoy talking about the history of the game, these books become both great conversation starters and reference guides. The format of the book being each player is his own chapter makes finding facts about that particular player a breeze. These books will be a valuable asset in a fans library if ever some fact checking needed to be done to win a bet. Each of Lew Freedman’s books I have read in the past have all met a very high standard and these two new ones are no exception. Fans of the specific teams will love them and have the knowledge to agree or disagree with the picks in the books. If your knowledge of the specific team is not very strong these books are still valuable to the reader. It will allow you to strengthen your knowledge of some of the greats and not so greats in the game’s history, as well as decide whom you really think are the 50 greatest players of that team. In the end you may not agree with all 50 of the picks but it definitely gets you to start thinking.